U.S. Buildings steel buildings and prefabricated steel metal storage buildings are ideal and affordable solutions for distribution facilities and shipping buildings. Our clear-span steel buildings can be built with up to 90 feet of useable width space and column free interiors, providing thousands of usable square feet for shipping and distribution. 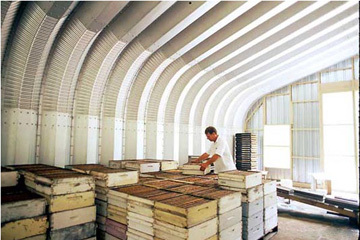 U.S. Buildings steel buildings and prefabricated buildings are designed to save you time and money. They are constructed in a fraction of the time it would take a regular red-iron building to be constructed. Our products are also fully customizable with possibilities like insulation, doors, windows and more. The lengths and widths of our prefabricated steel metal buildings are endless and can be used to suite your needs perfectly. By choosing a steel metal building from U.S. Buildings you will save up to 60% off other building style prices. Call us today to start on your project. We specialize in high quality, American made steel buildings and have been pleased to help many businesses achieve the perfect facility for their needs. Call U.S. Buildings now toll-free 800-222-6335 to speak with one of our steel building specialists. Be sure to ask about our money saving building specials that could save you up to 60% off your steel structure. You give us the specifics of your building projects and we’ll provide you with great options, a competitive price and a building that you’ll be proud to show off. Call us now!